The Jerusalem Police temporarily barred visitors from Temple Mount Sunday, following the discovery of rightist flayers urging the "purification of Temple Mount from the enemies of Israel." Muslim worshipers' access to the area has not been disturbed. The decision followed a district security assessment. The police expressed concerns that the intent of some of far-right Likud member Moshe Feiglin's followers to enter the compound would incite riots. The publicized visit caused what the police described as "agitation" among east Jerusalem's Palestinian neighborhoods. "Feiglin's people come to Temple Mount almost every month. The difference this time was the flyers," a police source said. 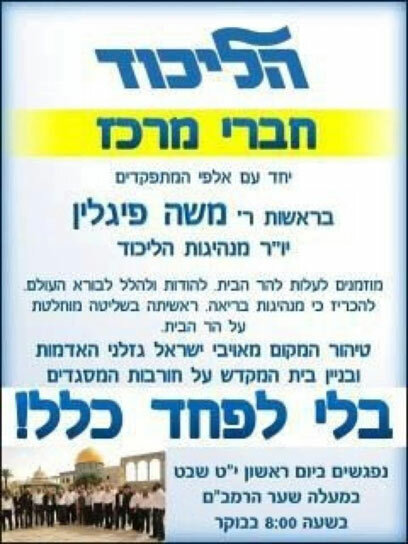 The flyers found near the compound reads: "Member of the Likud Caucus, along with its thousands of members, headed by Moshe Feiglin are hereby invited to arrive at Temple Mount and praise God, and declare that healthy leadership begins with total control over Temple Mount. "(Let us) purify this place from the enemies of Israel, who rob lands, and build the Temple on the ruins of mosques. We need not be afraid!" According to the police, the flyer "cause Hamas members and other individuals in the city's east to 'heat things up' and try to incite riots on Temple Mount. "A security assessment determined that the compound should be closed for visitors. Muslim worshipers can pray as usual," the source said. Feiglin himself arrived at Temple Mount with a group of his followers, but was forced to turn back. "Calling for the destruction of a holy place like Temple Mount is an attempt to harvest political gain through provocation," another police source said; adding that the department was investigating whether the flyers constitute criminal incitement. "There are plenty of elements that want to use the Temple Mount compound and the Western Wall Plaza as a platform for political gain. We won't allow anyone to do so." Feiglin's camp denies any connection to the flyers, calling them "a well-timed provocation." They expressed confidence in the police's ability to "find the real culprits." See all talkbacks "Feiglin barred from Temple Mount over political flyers"